The design objective of the TAA procedure is to provide a transition method for arriving aircraft with GPS/RNAV equipment. TAAs also eliminate or reduce the need for feeder routes, departure extensions, and procedure turns or course reversal. The TAA is controlled airspace established in conjunction with the standard or modified RNAV approach configurations. The standard TAA has three areas: straight-in, left base, and right base. The arc boundaries of the three areas of the TAA are published portions of the approach and allow aircraft to transition from the en route structure direct to the nearest IAF. When crossing the boundary of each of these areas or when released by ATC within the area, the pilot is expected to proceed direct to the appropriate waypoint IAF for the approach area being flown. A pilot has the option in all areas of proceeding directly to the holding pattern. The TAA has a “T” structure that normally provides a No Procedure Turn (NoPT) for aircraft using the approach. [Figure 1-12] The TAA provides the pilot and air traffic controller with an efficient method for routing traffic from the en route to the terminal structure. 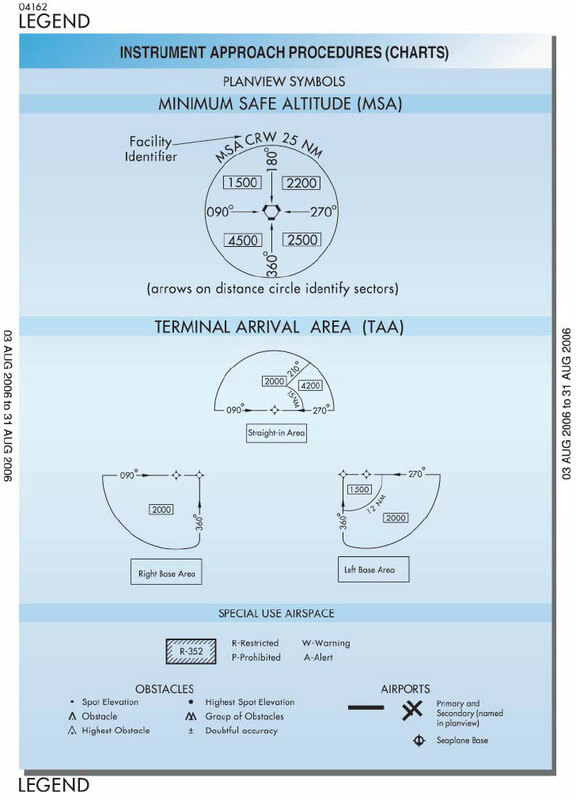 The basic “T” contained in the TAA normally aligns the procedure on runway centerline with the missed approach point (MAP) located at the threshold, the FAF 5 NM from the threshold, and the intermediate fix (IF) 5 NM from the FAF. In order to accommodate descent from a high en route altitude to the initial segment altitude, a hold in lieu of a procedure turn provides the aircraft with an extended distance for the necessary descent gradient. The holding pattern constructed for this purpose is always established on the center IAF waypoint. Other modifications may be required for parallel runways or special operational requirements. 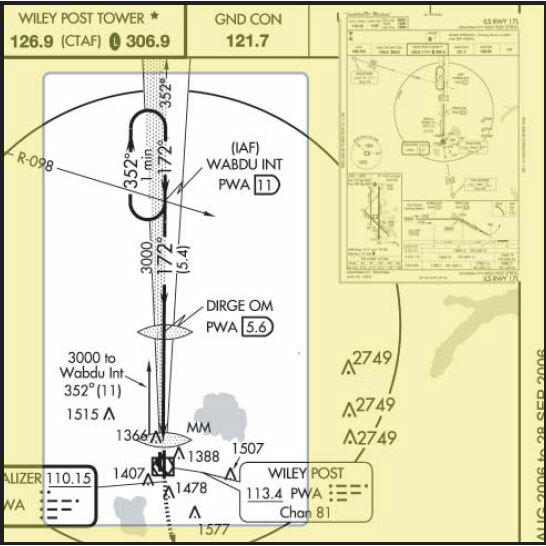 When published, the RNAV chart depicts the TAA through the use of icons representing each TAA associated with the RNAV procedure. 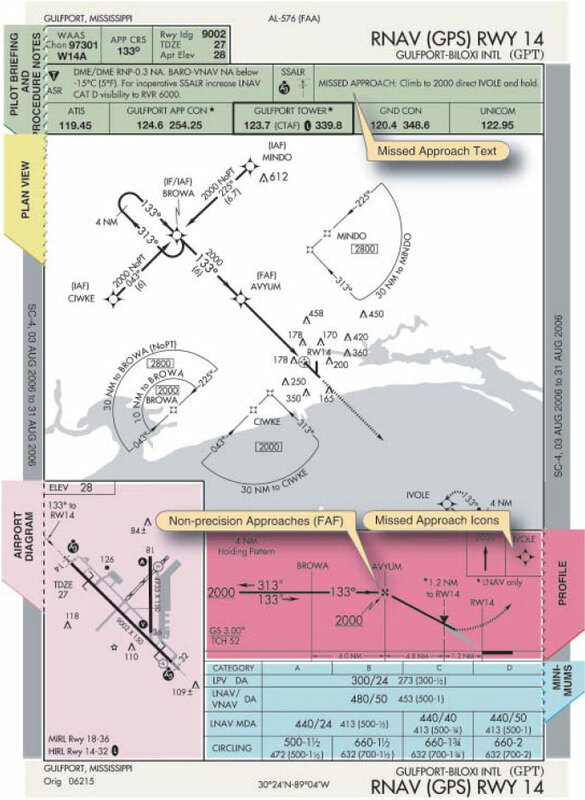 These icons are depicted in the plan view of the approach, generally arranged on the chart in accordance with their position relative to the aircraft’s arrival from the en route structure. 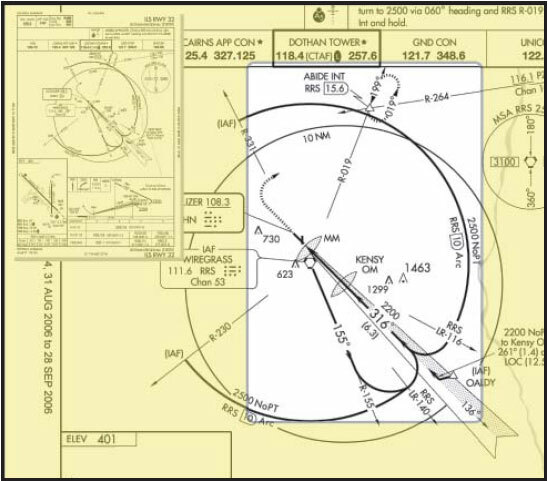 Course reversals included in an IAP are depicted in one of three different ways: a 45°/180° procedure turn, a holding pattern in lieu of procedure turn, or a teardrop procedure. The maneuvers are required when it is necessary to reverse direction to establish the aircraft inbound on an intermediate or final approach course. Components of the required procedure are depicted in the plan view and the profile view. The maneuver must be completed within the distance and at the minimum altitude specified in the profile view. Pilots should coordinate with the appropriate ATC facility relating to course reversal during the IAP. A procedure turn barbed arrow (see below) indicates the direction or side of the outbound course on which the procedure turn is made. [Figure 1-13] Headings are provided for course reversal using the 45° procedure turn. However, the point at which the turn may be commenced, and the type and rate of turn is left to the discretion of the pilot. Some of the options are the 45° procedure turn, the racetrack pattern, the teardrop procedure turn, or the 80°/260° course reversal. The absence of the procedure turn barbed arrow in the plan view indicates that a procedure turn is not authorized for that procedure. A maximum procedure turn speed of not greater than 200 knots indicated airspeed (KIAS) should be observed when turning outbound over the IAF and throughout the procedure turn maneuver to ensure staying within the obstruction clearance area. The normal procedure turn distance is 10 NM. This may be reduced to a minimum of 5 NM where only Category A or helicopter aircraft are operated, or increased to as much as 15 NM to accommodate high performance aircraft. Descent below the procedure turn altitude begins after the aircraft is established on the inbound course. Figure 1-13. 45° procedure turn. The procedure turn is not required when the symbol “NoPT” appears, when radar vectoring to the final approach is provided, when conducting a timed approach, or when the procedure turn is not authorized. Pilots should contact the appropriate ATC facility when in doubt if a procedure turn is required. A holding pattern in lieu of a procedure turn may be specified for course reversal in some procedures. [Figure 1-14] In such cases, the holding pattern is established over an intermediate fix (IF) or a FAF. The holding pattern distance or time specified in the profile view must be observed. Maximum holding airspeed limitations as set forth for all holding patterns apply. The holding pattern maneuver is completed when the aircraft is established on the inbound course after executing the appropriate entry. If cleared for the approach prior to returning to the holding fix and the aircraft is at the prescribed altitude, additional circuits of the holding pattern are neither necessary nor expected by ATC. 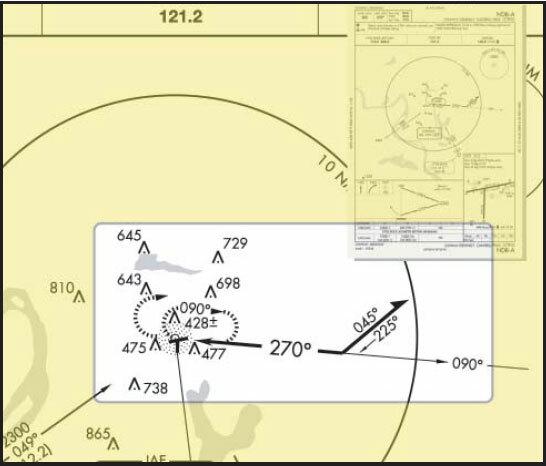 If pilots elect to make additional circuits to lose excessive altitude or to become better established on course, it is their responsibility to advise ATC upon receipt of their approach clearance. When holding in lieu of a procedure turn, the holding pattern must be followed, except when RADAR VECTORING to the final approach course is provided or when NoPT is shown on the approach course. Figure 1-14. Holding in lieu of procedure turn. When a teardrop procedure turn is depicted and a course reversal is required, unless otherwise authorized by ATC, this type of procedure must be executed. [Figure 1-15] The teardrop procedure consists of departure from an IAF on the published outbound course followed by a turn toward and intercepting the inbound course at or prior to the intermediate fix or point. Its purpose is to permit an aircraft to reverse direction and lose considerable altitude within reasonably limited airspace. Where no fix is available to mark the beginning of the intermediate segment, it shall be assumed to commence at a point 10 NM prior to the FAF. When the facility is located on the airport, an aircraft is considered to be on final approach upon completion of the penetration turn. However, the final approach segment begins on the final approach course 10 NM from the facility.